according to the copyright holder's published policy. 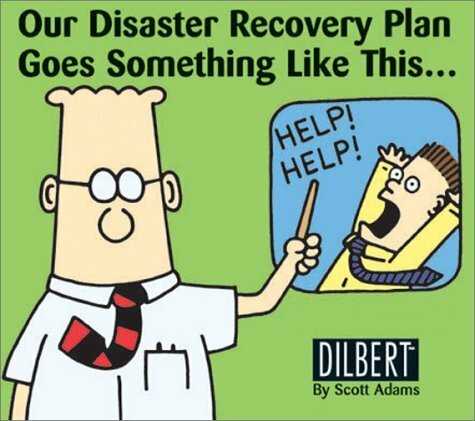 Working in groups of two or three (no more), write a brief (two or three page) disaster recovery policy/procedure (DRP) document for HCC. You can assume the relevant equipment includes the HCC public servers (web, mail, ftp) and the private ones (student records, human resources database, payroll) on each campus. You are free to include any additional assumptions about HCC policies you wish, or you can try to interview one of the HCC Computer Systems Administrators, or ask your instructor. In any case you should document the assumptions you've made so your policies make sense. For our class DRP project you can invent any people you need or consult HCC's directory to use the actual people with these roles. Make up personnel, phone numbers, safe deposit boxes at fictitious banks, and invent roles and policies as needed. You need not be accurate, but I will be checking that the major points of such a document are included, and that the whole document as well as each procedure makes sense. Some Sample (template) DRPs can be seen at www.drj.com. A Google search for Sample DRP will turn up some, such as this one for Texas A&M University. An email (preferred) or printout of your document with the names of all group members clearly printed on the first page. (Remember that multi-page documents should be stapled.) Submit only a single printout or email per group. Send email to . Please send email as plain text with no attachments, and "cc" the other group member(s). Any feedback will then be sent back to all group members. Each group member will receive the same grade for this project. How the work is divided between group members is up to each group, but it is suggested that all group members meet to "brainstorm" the DRP in one or two sessions, then each group member creates their own version and send them to the other members via email. Finally integrate all the (good) ideas into a single final version. Groups can meet in person (say before/after class) or via instant messenging, conference calls, or chat rooms. In the event that I receive complaints that one group member isn't pulling their weight in the group, adjusted grades may be awarded. Please see your syllabus for more information about submitting projects. This page was last updated by Wayne Pollock.